Microcirculation Supplements for heavy legs - ESI S.p.A. Heavy legs are the result of an unhealthy lifestyle and bad habits like standing for too long or crossing your legs when sitting. Heavy legs are a sign of poor blood circulation which gets worse during the summer months. In order to promote circulation and strengthen blood capillaries you can take natural supplements that use the beneficial properties of plants such as Ginkgo Biloba, Horse Chestnut and Bilberry. 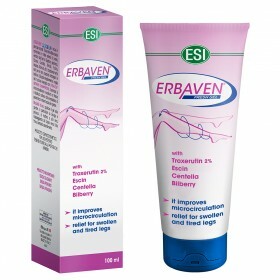 ESI’s Erbaven, contains plant extracts which favor leg movement tropism which reduces swelling and heaviness. 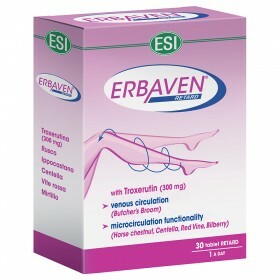 Erbaven with Troxerutin is available in: slow release formula capsules that gradually release nutrients, and in a moisturizing cream-gel that is rich in nutrients, and is hypoallergenic and colouring free.